For visitors to the African bush, the giraffe is always a popular sighting. Our giraffe gallery depicts this statuesque and attractively marked animal in a number of the typical stances you're likely to see while on safari. Because giraffe are so tall, you can often photograph their long necks and heads against the sky, without distracting foliage in the background. The dramatic red skies that occur in Africa at sunset or sunrise make for interesting silhouettes, as in the first image in the thumbnails below. The rather unusual photographs of a giraffe and zebra and two giraffe with an ostrich were taken at Tala Private Game Reserve. The topography in this malaria-free reserve near Durban on South Africa's east coast allows one to get pictures of even small animals against the skyline, something not possible in many game parks. Giraffe are widespread in Africa and occur in most of the major game reserves and national parks in East and Southern Africa and have earned an iconic status among the continent's wildlife. This is understandable as the giraffe is truly unique with the genus containing only a single species, Giraffa camelopardalis. 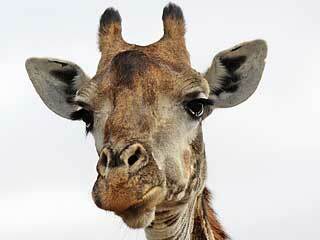 The giraffe is also the world's tallest animal, with males reaching heights of 5.5 metres (18 ft) from head to toe. Females give birth standing up because they cannot easily sit or squat - so a baby giraffe starts life with a bump, being dropped on its head from a considerable height! The baby is born with horns - another feature unique to giraffes. As males mature, they use their heads to fight so that the tips of the horns become bald, while the female's horns retain hair on the tips. When taking close-up shots of a giraffe, remember you'll usually be aiming upwards, so take care that your camera's light-meter isn't fooled by the bright sky in the background, thus under-exposing your subject and leaving you with an unwanted silhouette. You can also experiment by using your camera's flash in "fill-in" mode, as this will often cause a highlight or "catchlight" in the giraffe's dark eyes. This always adds some sparkle to wildlife images.